Your baby is off to school … child care blues are over. Right? Wrong! A study of parental concerns about after-school time found some troubling patterns. Among the findings was that parental concern was high when work hours were long, parents had little control over work schedules and children spent time unsupervised after school. The study conducted by the Women’s Studies Research Center at Brandeis University also noted that parents who had high concerns also reported high levels of anxiety and depression. About 2.5 million working parents are overly stressed by after-school concerns and are likely to bring them to the workplace. These concerns are exacerbated for the parents who have more responsibility for child care in the household, who work longer hours and whose children are older (grades 6-12) because these kids tend to spend more time unsupervised. I cannot find a reliable arrangement for care during after school, summer and other out of school time. You are not alone. Per Afterschool Alliance, in 2014, approximately 19.4 million children (41 percent) not currently in an afterschool program would be enrolled in a program if one were available to them, according to their parents. In simpler terms, for every one child in an afterschool program, two are waiting to get in. Too many parents put together a “patchwork quilt” of caretakers — neighbors, friends, relatives, sitters. Often, such arrangements fall apart at the last minute leading to heightened stress and anxiety. My child participates in an after school program. However, I am concerned that he/she is mostly just left to play around. For children ages 9 to 11, 10.5% are in “self-care” after school, according to 2011 census data. For children 12 to 14 years old, the figure is 32.7%. Unsupervised teenagers are vulnerable to many risky behaviors, such as drugs, alcohol, sexual acting out and crime. Today, 10.2 million children participate in an afterschool program. Good news that your child is in a program and not completely unsupervised. Different afterschool providers take different approach to the programs. Some focus on homework help and free play, some on structured physical activities while others focus on educational enrichment and arts, etc. Check with your afterschool provider to ensure that there is a fit per your needs. What type of program is considered good for afterschool, camps and other out of school time? Per APA, American Psychological Association, there is no consensus on a type of program. The answer is a combination of different programs and experiences for children. Some schools believe in offering a menu of programming ranging from traditional homework help and free play to music, arts, sports and educational programs. They bring in service providers on-site to provide specific programming for each day. In this scenario, parents can choose the programs and provide a new enriching experience each day for their child. The Afterschool Alliance provides a nice compilation of characteristics of quality out of school programs by grade level. 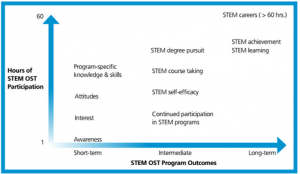 What are STEM programs and are they effective for out of school time? STEM is an acronym for Science, Technology, Engineering and Math. STEM programs represent a multitude of educational programs intended to engage students with the growing fields of science and engineering. Research shows that after school time is a great way to bring enriching experiences in STEM to the participants in a low pressure environment. Thereby, allowing children to experience these fields in a more immersive way. These programs are also well positioned to close opportunity gap for underrepresented youth. Per US Department of Education, while underrepresented minorities make up 36% of the college age population, they are only 11% of the engineering degrees/certificates earned. Per Change the Equation, over the last 13 years, there has been no significant change in women representation in STEM workforce. Women represent about 12% of engineering workforce, 10% of advanced manufacturing and 25% of computing workforce. A research conducted by Dr. Kelly Riedinger, Senior Researcher at Oregon State University and Dr. Amy Taylor, UNC Wilmington, as reported in the latest issue of Afterschool Matters publication, suggests that engaging girls in science in out of school time setting enhanced their identity and sense of self as learners of science. While STEM programs are not readily available across all markets, many cities / suburbs boast a varying set of offerings. Look for programs that are specifically designed to align with school standards, ignite student interest, highlight real world connections and extend STEM learning. How long should I have my child participate in STEM programs for best results? Per National Institute on Out-of-School Time (NIOST)’s Afterschool Matters, STEM out of school (OST) time programs that engage students for longer periods of time such as afterschool, Saturday or summer programs, hold greater potential for affecting intermediate and long-term outcomes than do short duration programs. The below diagram from the same source succinctly summarizes this relationship between duration and outcomes.